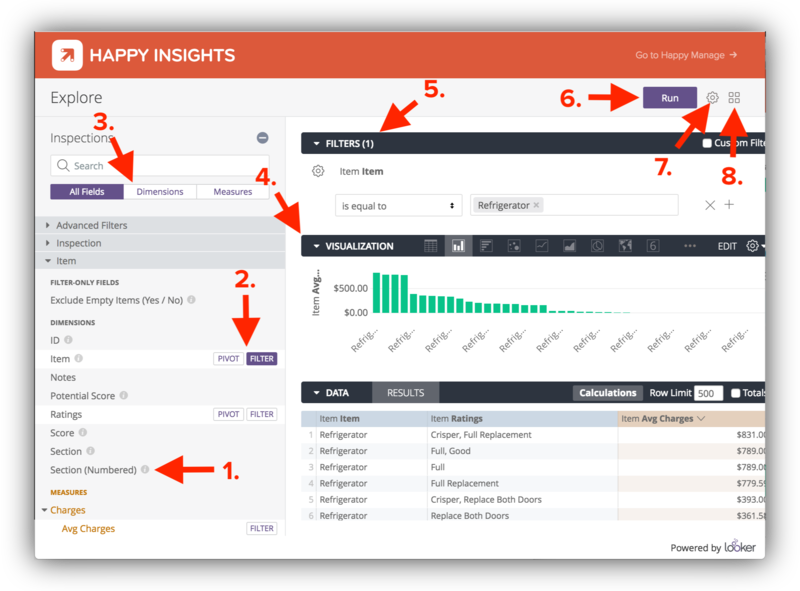 Never has it been easier to explore you Inspection data than with HappyCo’s Happy Insights. Go beyond the out-of-box dashboards with Explore, by creating dashboards on the fly, which can be used for one-off queries, or they can be saved as a new dashboard for future reference. Further Information - It may not be immediately apparent to what each measure represents, hover over this icon to view additional information about the item. Pivot and Filter - These are the main ways you will pull and sort the relevant information. 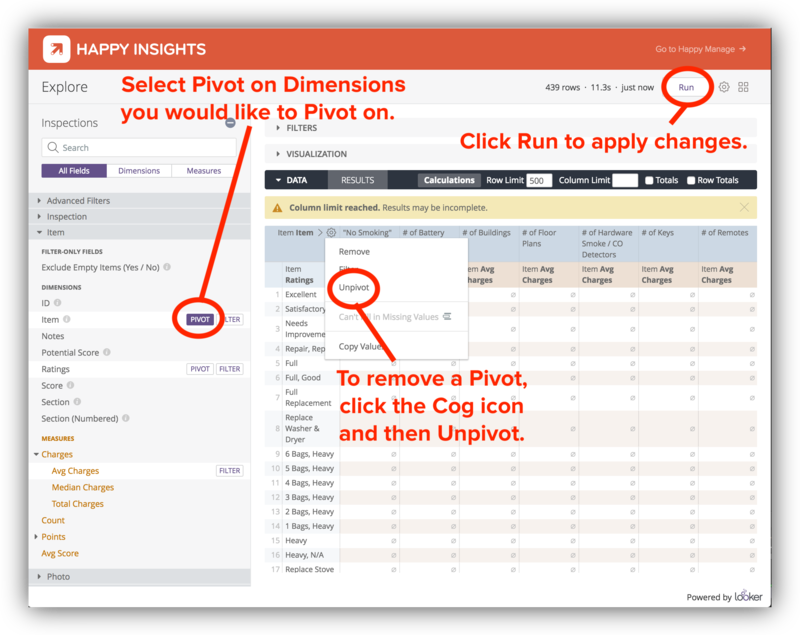 Filter allows you to specify the information pertinent to your query, and Pivot enables you to determine how the data is displayed. Measures and Dimensions - These are your primary tools for building your query. Dimensions are the objects you will be filtering on, such as an Item, Template or property, whereas Measures are fields that provide a numerical measure on the dimension, such as a number or score. Clicking these will add them to your look, and display the data as a column when you click Run. Visualization - This allows you to view your data visually, using a range of graphs and charts. Filters - The the combination of Dimensions and Measures will determine your Filter. Run - Once you’ve applied your Filters, click Run to see the results. If you make any changes to the Filters, you’ll need to click Run after every update. Settings - The Settings is where you will be able Save, Share or Remove the data. Looks and Dashboards - This is where you will be able to navigate to your saved Looks and Dashboards. Get a better understanding of your data by using Pivot tables to display your Data. Pivoting on objects will provide a horizontal view of the data, giving you a better visual understanding of the results by creating a column for each recorded value. To use Pivot tables be sure to have at least one object Pivoted and one Measure added to your look. You can add as many Pivots as you’d like but will need to have at least one measure applied. Now that you’ve retrieved the data you want, you may want to refer back to it in the future. To do this, you’ll need to save it as either a look or a dashboard. What’s the difference between a Look and a Dashboard? Looks are a combination of Filters, Dimensions, Measures and Visualizations that will pull a segment of data. A Dashboard is a collection of Looks that will give you multiple points of data and will allow you to add filters to query against the Looks. How do I save a Look and to Dashboard? From the Explore screen, you can easily save your query as a Look or Dashboard by clicking the Gear icon, then selecting either Save as Look or Save to Dashboard. All Filters, Dimensions, Measures, and Visualizations will be saved and applied to your Look/Dashboard. If the query you have built is only going to be used in one Dashboard, you may want to select Save to Dashboard. If it’s a query you can see being used in future Dashboards, you can save it as a 'Look' to keep until you want to apply it.